Now that it’s October, Spooky Halloween Decor Ideas are in season! Here are some scary ways to get your home ready for Halloween. Catch these projects live on KOMO-TV Tuesday October 4th at 4pm. All the fun stuff is available at Ben Franklin Crafts and Frames in Redmond. Supplies: cardboard skull, white acrylic paint, translucent glitter, black paint pen, colored paint pens and Royal Coat. 1. Paint the skull white. 2. Draw flowers and designs on the skull with the black ink. 3. Fill in with colored ink. 4. Apply a layer of Royal Coat. Supplies: glass cloche, plastic ghost, pie tin, moss, faux spider webbing, vinyl branches and glue dots. If you have some Halloween ribbon handy, grab that too. You can find the craft supplies at Ben Franklin Crafts and Frames in Redmond. Step 1: Turn the pie tin upside down and use glue dots to attach moss to it. Step 2: Add vinyl branches to the cloche. Step 3: Grab some spider webbing and a glue dot. 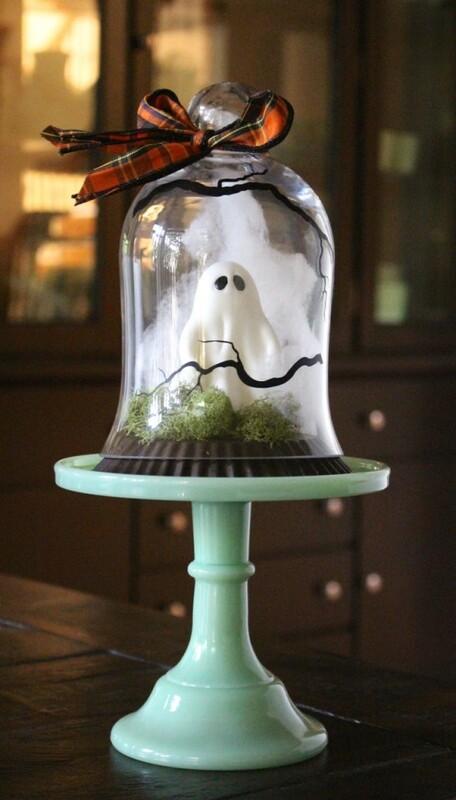 Place the glue dot at the inside the top of the cloche and add some spider webbing to it to make a spooky looking cloud. Step 4: Add some Halloween themed ribbon. 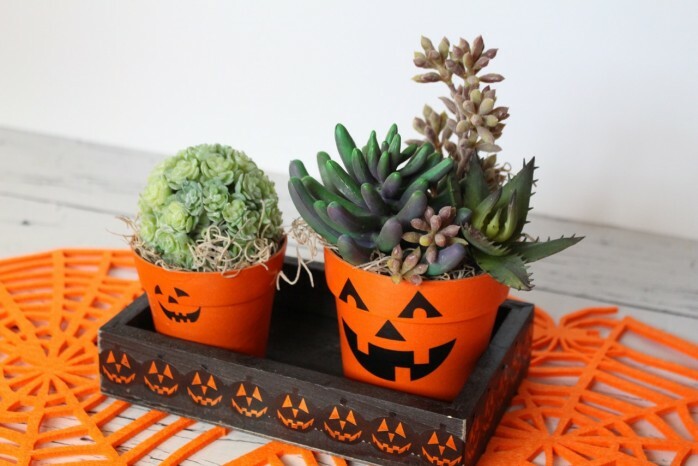 Supplies: wood tray, black paint, jack-o-lantern washi tape, small plastic orange flower pots, vinyl jack-o-lantern faces, spanish moss and faux succulents. 1. Paint the tray black. 3. Add the vinyl to the flower pots. 4. Fill the flower pots with the Spanish moss and succulents. 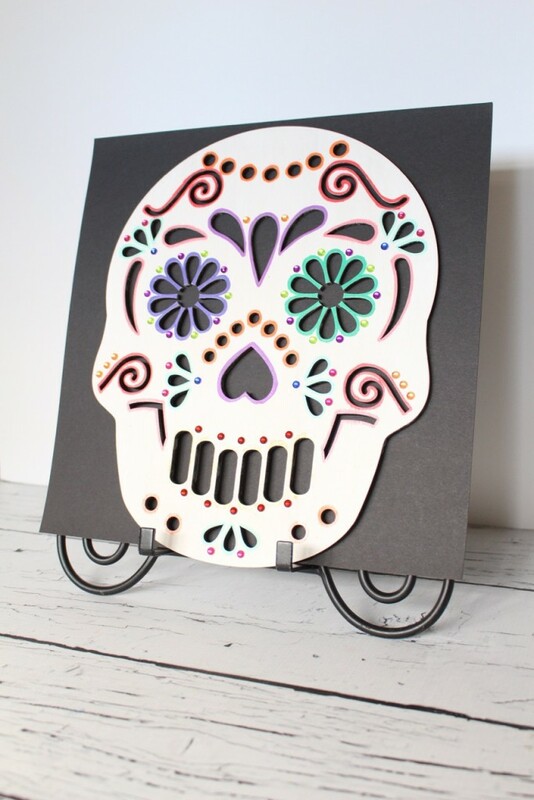 Supplies: Wood Skull, white paint, paint pens, adhesive gems. 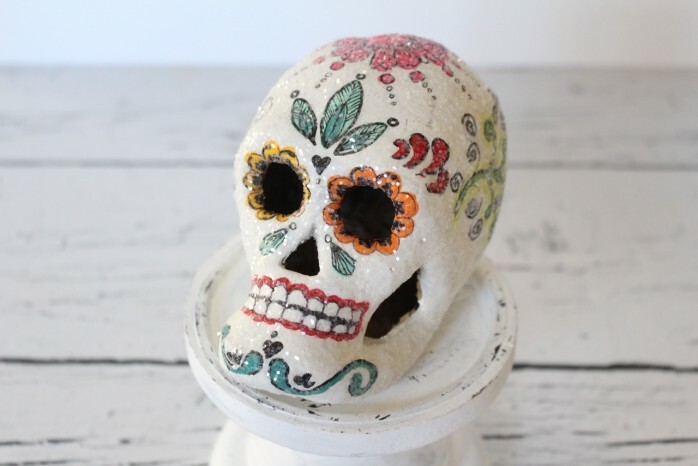 Directions: Paint the skull white. Trace around the shapes with paint pens. Add adhesive gems. 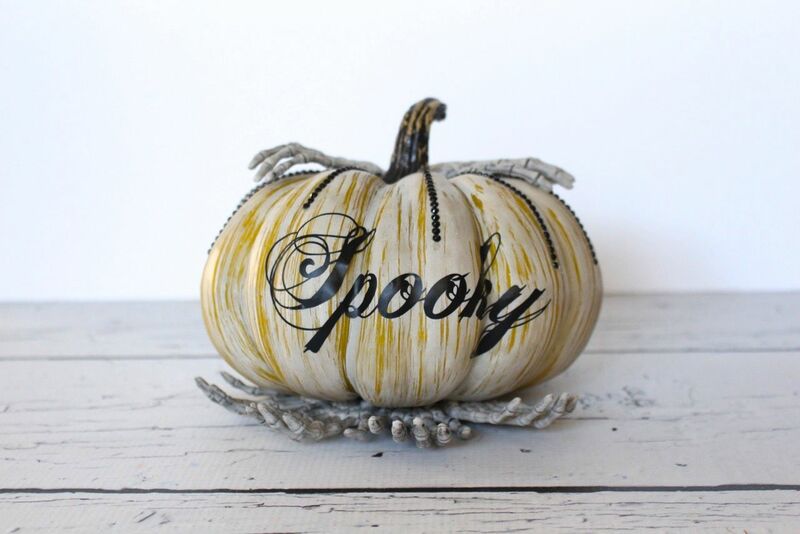 Supplies: plastic pumpkin, vinyl “Spooky,” black adhesive gems, plastic bone hands, hot glue. 1. Apply vinyl to pumpkin. 3. Glue hands on top and bottom of pumpkin. 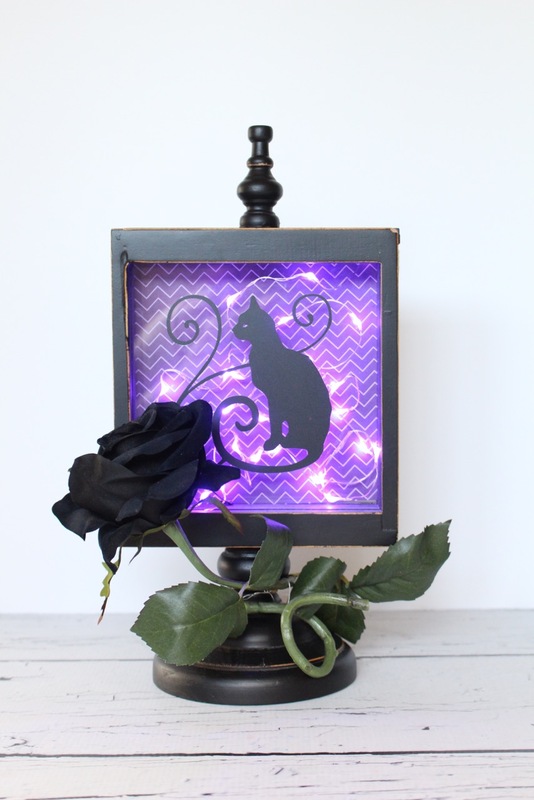 Supplies: frame, black cat vinyl, scrapbook paper, firefly lights, faux black rose and wire. 2. Add cat vinyl to glass. 4. Wrap flower around base and secure with wire. Supplies: glass skulls, firefly lights, glitter, glitter it and ribbon. To make the skull on the left, pop a string of lights inside. 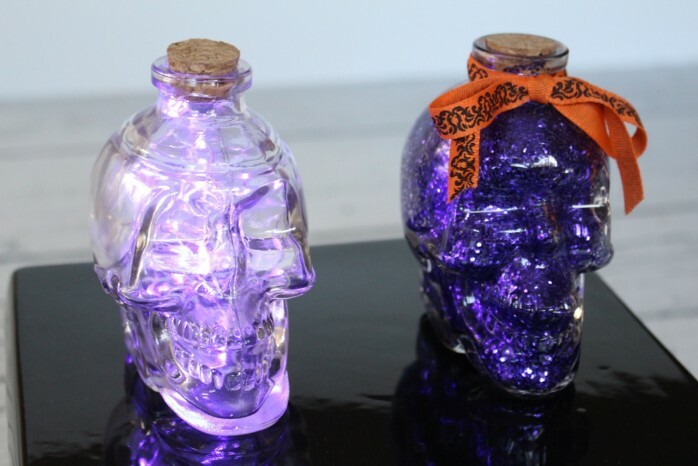 To make the skull on the right, add Glitter It, swirl around and dump it out. Then add glitter and dump that out. Tie a ribbon around the top. I saw the adorable Ghost under Glass at the Link Party Palooza, and now I see that all seven of your Halloween ideas are so cute. I can’t pick a favorite. Hello Malia, wow! 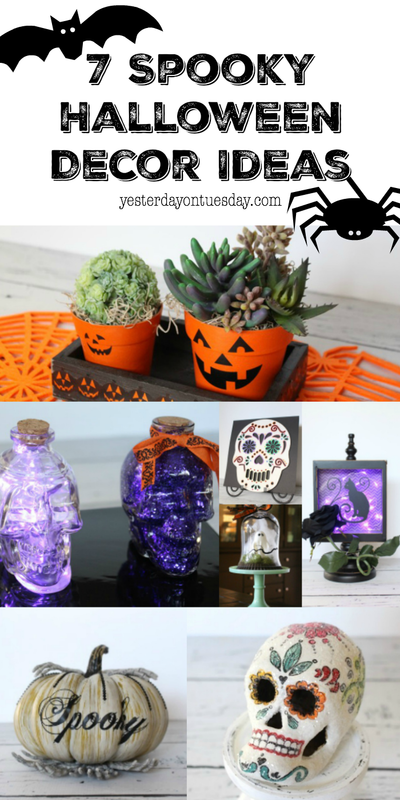 This is an amazing idea to decorate home with spooky Halloween theme. This is low budget and so impressive to make home attractive. Thank you so much for sharing.